These simple roasted radishes make a fantastic healthy low-carb side dish. If you’re looking for something a little different, give these a try! Are you a radish fan? They’re sometimes a bit sharp for me when they’re raw. Cooking radishes solves that problem! I like to roast them for an easy side dish. The color is also really pretty and perfect for spring. Cooked radishes are a lot milder than raw ones. Roasting them takes away that sharp edge that raw radishes often have. 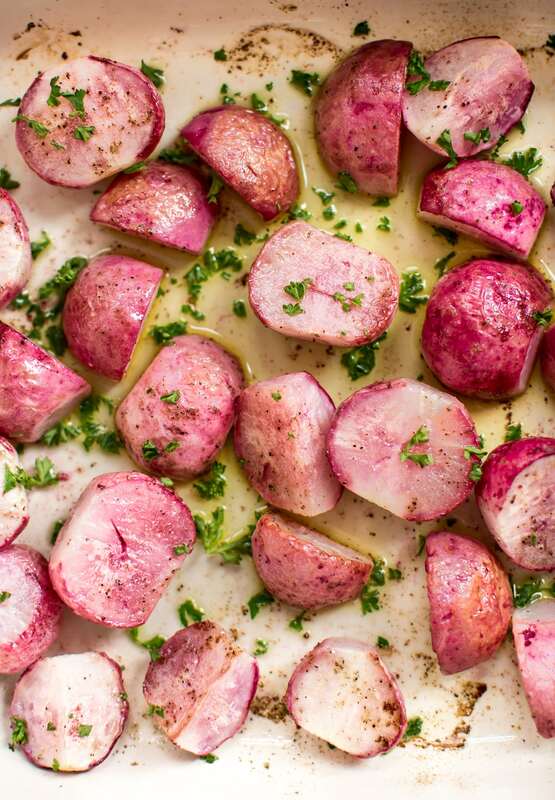 A lot of people on low-carb diets like to substitute roasted potatoes with roasted radishes. I don’t eat low-carb, but there’s a fun fact for you. These roasted radishes are keto-friendly. Cut radishes into roughly equal pieces. Coat them with olive oil in a roasting pan and toss with salt & pepper. Roast at 400F until they’re tender-crisp. I ended up roasting mine for about 30 minutes since they were a bit larger (even after cutting them up). I’d check your radishes after 15 minutes if yours are on the smaller side. It also depends on how tender you want them to be. Hope you enjoy this easy roasted radish recipe! Let me know in the comments below if you’ve tried this recipe or have any questions. I also made a delicious summer veggie pasta with roasted radishes a couple of years ago if you’re interested. These simple roasted radishes make a fantastic healthy low-carb side dish. If you're looking for something a little different, give these a try! Preheat oven to 400F. Move the rack to the middle position. Cut the radishes into equal-sized pieces. If they're particularly large radishes, cut them into quarters. Otherwise, cut them into halves. Add the radishes to a baking dish and toss them with the olive oil and salt & pepper. Roast them face down if you want them to brown nicely. If the radishes are small, roast them for 15 minutes and check to see if they're done to your liking. If they're larger, it may take up to 35-40 minutes to get them tender. Mine took about 30 minutes to get tender-crisp. Toss with freshly chopped parsley if desired. Love roasted veggies? Try my maple roasted beets and carrots or my balsamic parmesan roasted broccolini. I never knew you could roast radishes. I mean, I don’t even ever consider cooking them. Thank you! I’m going to try it. I don’t particularly like the taste of raw radishes either. A little too sharp for me too. I’m definitely going to try roasting them! I tried these and to my UTTER AMAZEMENT they were fantastic!! I never in my wildest dreams thought about roasting radishes as if they were a real vegetable and not just a pretty addition to a green salad. Kinda reminded me of potatoes. Haha that’s great!! So glad you liked them, Jane! My granddaughter is on a low-carb diet and misses potatoes. Going to try these and see how she likes them. Thanks!